For any parent and indeed for any child a reading of the Old Testament account of the call from God to Abraham to sacrifice his only legitimate son, Isaac, for whom he first had to wait so long, is a heart rending, perplexing and gripping tale (Genesis 12-25). First God had promised Abraham that he would become the father of many nations with descendants as numerous as the stars in the night sky. Yet Abraham and his wife Sarah grew aged with no legitimate child in view. Desperate, Sarah advises Abraham to lie with his maidservant Hagar, who conceives a child, Ishmael. Then, 14 years later, finally Isaac is born to Sarah. Yet subsequently, as the boy grows up, Abraham is told by God to go up into the hills and to offer this very boy as a sacrifice to God. Imagine Abraham’s perplexity! Share in mind his heavy heart as he climbs that hill together with Isaac and a bundle of wood, but no evident sacrificial lamb! Imagine, when Isaac asks his father about the lamb for the sacrifice, Abraham looking into the boy’s eyes and telling his son that the Lord will provide – all the time knowing that the boy walking with him, his beloved son, is to be the offered sacrifice. Then comes the time to set down the bundle of wood, make the fire and steel himself for the appalling act of cutting his own son’s throat. Try to imagine Abraham’s torment and confusion, as he wrestles to carry out this act of obedience. Somehow Abraham trusts God that even so God’s promise that he will be a father of many nations can yet be fulfilled. Imagine his anguish for his son, the sense of paternal betrayal he must have surmised roiling in the boy’s mind. While he had not told Isaac that he was to be the sacrifice, now, in binding the boy’s hands and drawing his knife, the intent was all too evident – or so they both must have thought. 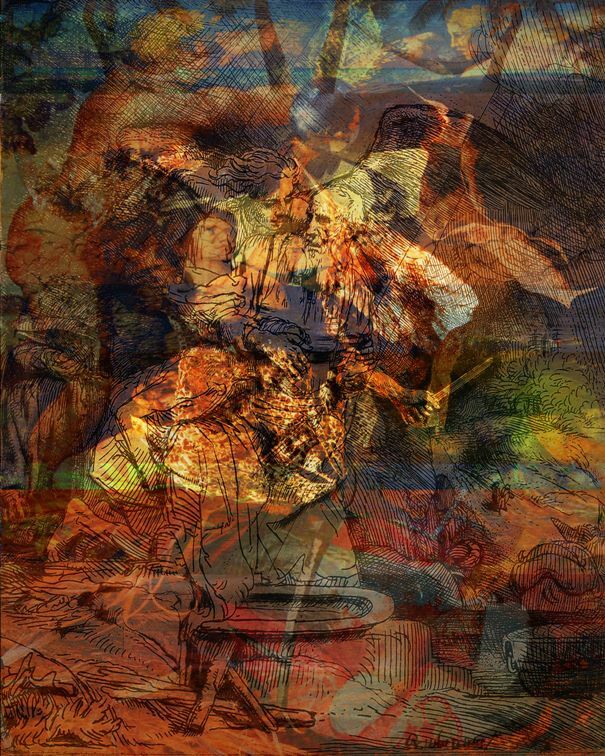 In making this digital collage, designed for display in my church along with other dramatic moments from the grand biblical narrative, my chief aim was to convey something of the confusion that must have swirled in Abraham’s mind. I decided to make an image whose composite form would itself reverberate with that confusion, while also evoking the context for why sacrifice was necessary in the first place. This digital collage was made to hang alongside other pieces in this biblical series including The Creation, The Fall of Humanity and The Crucifixion (to see the whole series, click here). I used semi-opaque layers from the first two pieces – Creation and Fall – to call up for the viewer the remembrance that we live in a world created for us by God, in which we however have rebelled against him and so became separated from him by our sinful natures. Sacrifice was instituted to constantly remind us that only shed blood can propitiate for our sin and so restore our relationship to our Creator. Thus in this digital image one underlying layer is my earlier image of the six days of Creation and the seventh of rest – the hammocks on a beach (click here). The other underlying layer calls up my earlier The Fall of Humanity, based on Michelangelo’s Sistine Chapel ceiling (click here). The etched linear drama of the angel seizing Abraham’s arm in time to prevent the slaying is taken from Rembrandt’s etchingThe Sacrifice of Isaac (click here). This etching includes two diagonal lines suggesting the presence of God in a shaft of light, which in my Crucifixion scene, also based on Rembrandt, recurs in exactly the same place in the composition, so reminding the viewer that Christ fulfilled that from which Isaac was spared. E. John Walford: Abraham’s Offering of His Son, Isaac, 2012, 24” x 30”, digital collage printed on canvas and mounted on a wood stretcher. E. John Walford is a Professor Emeritus of Art History. He taught at Wheaton College, Illinois, for thirty years. In the past decade he has also practiced photography and digital collage, in which latter medium he has made thirty biblical scenes for use at Immanuel Presbyterian Church, Warrenville, Il. From September until December 2013 eight of the series, including the Abraham & Isaac piece, were exhibited, as "Glimpses of Grace," at the BrauerArt Museum, Valparaiso University, Indiana.